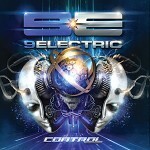 Electro/hard rock act 9Electric has released its newest EP, CONTROL. “We are stoked to release our EP CONTROL to the world! This release has many of the most popular songs that we’ve been playing as we’ve toured the country this year. We hope you all love it as much as we do and we’ll see you on the road as we continue our summer tour and again later this fall,” says 9E vocalist Thunderwood. The six-track EP features all new music including a special guest appearance from Heidi Shepherd of BUTCHER BABIES on the single “Bullet Tooth.” 9Electric recently toured with Powerman 5000 and is currently in the middle of a U.S. tour with support from Otherwise, Like a Storm, Righteous Vendetta, and more.